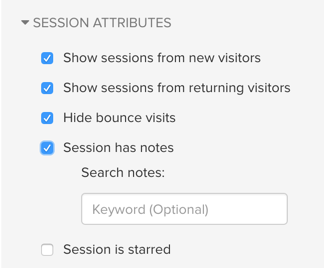 Any notes you write down can be searched for in the session filters to retrieve sessions that were interesting. See someone having trouble on a page or getting confused? Now you can leave a label like “confusion, wrong page” and search for all sessions exhibiting “confusion” later. The new playback sidebar also lets you directly play other sessions from the same user, view/edit tags, and more. It’s available to all users immediately, check it out! ← Increased Data Retention Across the Board – Introducing our New Data Retention Policy!